PETER REINHART is a full-time baking instructor at Johnson & Wales University in Providence, Rhode Island. He is the author of the acclaimed Brother Juniper’s Bread Book: Slow Rise as Method and Metaphor, Sacramental Magic in a Small-Town Café, Bread Upon the Waters, Crust & Crumb, the winner of the James Beard/KitchenAid Cookbook Award in 1998, and Peter Reinhart’s Whole Grain Breads, the winner of the James Beard Cookbook Award in 2008. Peter is a regular commentator on food and culture for public radio’s One Union Station. "Peter has combined the knowledge, passion, and expertise of a professional baker with the clear persuasive language of a born teacher. I predict immense well-deserved success for this extraordinary book." "As we continue our bread-making journey into the 21st century, Peter Reinhart’s The Bread Baker’s Apprentice should emerge as the definitive text on the subject. There is simply no other work where a student, and for that matter, many seasoned bakers, can turn to understand how the magic of great bread baking works." "Peter has yet again woven a fine tale about great bread, and his passion abounds. In The Bread Baker’s Apprentice, he delivers a tool box of information and insight–tools that empower us to roll up our sleeves and keep those ovens full!" "This remarkable book is written and designed to bridge the information gap between professional artisan baking and simpler home baking. The tricks, the tips, the checklists, the math, the lingo, the path to perfect fermentation, are all here at my fingertips." "If you are a serious home baker and wish to raise your level of baking several notches, then apprentice yourself to master bread baker Peter Reinhart in his new cookbook, The Bread Baker’s Apprentice. He instructs with gusto in this delightful and comprehensive volume." "Just as bread nourishes the body, The Bread Baker’s Apprentice nourishes the baker’s soul. Peter Reinhart’ s explicit recipes and detailed instructions are so well written that he takes the mystery out of mastery, giving you the sense that he is standing right beside you, coaching you to success." 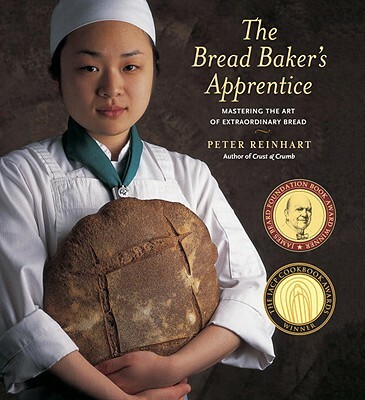 "Both novice and experienced bakers have cause to celebrate Peter Reinhart’s The Bread Baker’s Apprentice. Peter’s years of hands-on experience combined with his excellent teaching skills make this book the closest thing to having a master at your side as you bake."